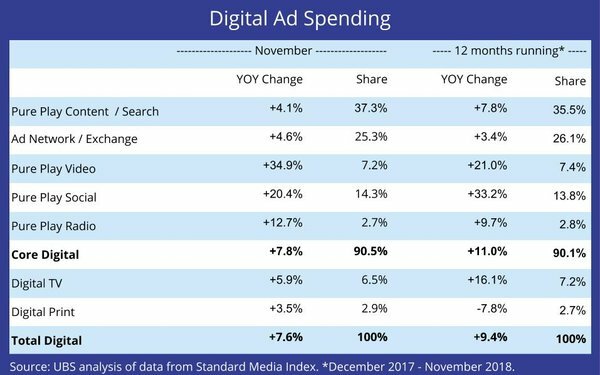 Driven by surging demand for online video, social and radio inventory, core digital ad spending expanded 7.8% in November, according to a UBS analysis of the latest data from Standard Media Index. While that represents a slowdown from the 11.0% rate of expansion core digital ad inventory experienced during the past 12 months, the UBS analysts said their “broader industry checks” remain positive -- especially demand for Google and Amazon. The UBS analysts noted that December data will be telling for digital advertising demand, because of the relative weight the month has vis a vis holiday-season demand.